Italian band Messa build on the cryptic rawness of their debut with this passionate Trad Doom follow-up. Messa are a cryptic Italian group who grabbed people's attention in 2016 from the raw and cold sounds of their self-released first album, 'Belfry'. The album was met with a pretty positive response, most notably for the blend of varying elements, the rough and bleak sound production, and the strong vocal performance. This second album, 'Feast for Water' expands a bit on what the band initially set out to play, tying in some more outside influences, and setting some focus on the band's strengths. The style of 'Belfry' could be summed up as raw, occult, Traditional Doom Metal that borders onto sections of old school Heavy Metal, with more epic sounding mid-to-up tempo passages that add energy to the mix. However, half of the tracks on the album consist of quiet sections of Drone and Ambient, which some could say seem a bit out of place with the rest of the music. Well, 'Feast for Water' sees the band dialing back from the Drone elements significantly; taking it in more as occasional quiet moments to create a mysterious atmosphere, rather than full tracks of several minutes in length. The bulk of the music still consists of Traditional Doom, though the band seem to have opened their doors a bit to let in some more unexpected influences to come in; this is what makes the album succeed. A nice feat to 'Feast for Water' is a tasteful Blues undertone. A notable characteristic of the band's sound is lead singer, Sara, whose voice ranges somewhere from rough, sultry Blues wails, to gentle, ethereal croons. This is complemented with a soulful, bluesy swinging riff style, most notably on 'The Seer', that has all the feel and chilliness to bring out a taste of the earliest releases of Black Sabbath. Going hand in hand is a significant Dark Jazz influence, in the vein of Bohren Und Der Club of Gore, which stands out most notably on a bleak saxophone solo towards the end of track 'Tulsi'. Interestingly enough, the first half of this track consists of an alternation between ominous Doom tempos, and full on explosions of Black Metal blastbeats with shrieked vocals. Lastly, the aforementioned Drone elements that were found consistently throughout 'Belfry' have been toned back to a two-minute opener track, and a heavy, drawn out conclusion to third track 'Leah' (which has a beautiful music video that I totally recommend watching). All of these outside influences and nuances mix and meld seamlessly into a tapestry of cold, atmospheric Traditional Doom, in which the spotlight is reserved for the interplay between intricate guitar leads and Sara's haunting lines. The rhythm guitars have a deep crunch to them, with slow chugging movements and drum crashes that match each change of chord. The lead guitar lines wail, with a shrill tone that stands out for each of the intense, emotional solos. There is a lead solo on almost every track, so those who are looking for some tasty shredding will feel satisfied. As it can be imagined, there are plenty of tempo changes through the album, with the inclusion of some epic sounding Heavy Metal climaxes that break down into downbeat bulldozers. While the ambience of 'Belfry' was strictly occult, primitive, and sinister, there is something much more benevolent here. There is less of an ominous presence in the melodies, and more of a calmness, though it's no less icy or morose. In fact, I would actually go as far as to say the music here is much more emotional, perhaps even devastating, than what I have heard from a majority of Trad Doom. On the more straightforward Doom tracks of the album (the aforementioned 'Leah' and 'White Stains'), there is this kind of emotional pique that both tracks reach in certain bridges of the song, where the tempo slows down, Sara's voice commands with depressive melodies, and cold sounding synths are utilized very subtly to enhance the intense atmosphere. Another notable improvement here from the debut is that the rawness in the sound quality is no longer there. The loud, noisy, dry production has been replaced with a fuller, deeper, more resonant sound that I can only think of the comparison between playing in a non-carpeted storage room, to playing in a church. There is something a bit more distant, echoing, and notably thicker sounding that really brings out that dark mood that the band brings to the table. 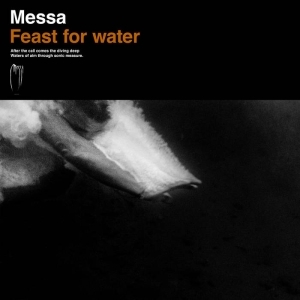 For those that weren't quite convinced with the band's debut, I think 'Feast for Water' will be what they need to properly appreciate Messa's style. This is a very progressive Doom album; not so much that it is Progressive Metal, but moreso that there is quite a bit going on, the songs take unexpected directions, creative risks are taken, and each band member is able to really showcase their talent on their given instrument. Most importantly though, the album has feeling; something I hear people say a lot about Blues musicians. You can really sense a sincere passion behind each song, which perhaps isn't always sought out in Metal as much as it potentially could be.